I'll admit it. I'm old enough to have played Pong, in my favorite watering hole back in the 1970s. Atari's table tennis game was one of the best of the early video arcade games. Using a simple knob controller, players scored points by bouncing a video ball past their opponent's paddle. 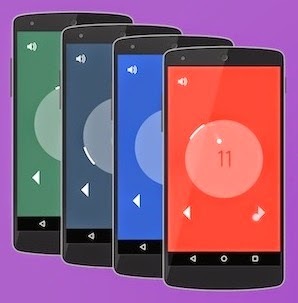 Now there's Circle Pong, a new version of that classic game that you can play on your Android device. In this version, you tap the screen to move a paddle that keeps a bouncing ball in motion. The goal is to keep the ball moving. Players have to watch and quickly calculate the angle of the ball's return trajectory as it caroms off the opposite surface. In this case, that surface is a curved wall, and that makes the physics a little more complicated. Your job is to intercept the ball before it leave the circulars playing area. With each return, you score a point. Like the original, Circle Pong is very addictive and a great time waster. And you don't need a pocket full of quarters to play. Check it out in the Google Play Store.